LONDON--(BUSINESS WIRE)--Vegetable proteins are growing in popularity with health-conscious consumers. Studies are suggesting they may be more beneficial than animal proteins, and food and beverage companies are beginning to use them in more products. According to Infiniti Research, the global market for protein ingredients is growing, and plant proteins are threatening to overtake their animal counterparts. While the market as a whole is expected to grow at a CAGR of 6.14% by 2020, the plant protein ingredient market will grow at a CAGR of 7.08%. Animal proteins currently make up about 55% of the market, but plant proteins are closing the gap, and are expected to account for almost 47% of the market by 2020. A study from Denmark published in late 2016 has revealed a new benefit of plant proteins: they may actually be more filling than protein from animals. Researchers tested three different types of breakfasts with three groups of men, measuring their fullness before and after each meal, as well as their caloric consumption at lunch. The study compared a high-protein meat breakfast with high- and low-protein vegetable meals. It found that those who had the high-protein vegetable option felt more full than the others, and consumed 12%-13% fewer calories at lunch. Also, those who had the low-protein vegetable version felt about as full as those who had the meat version. While both high-protein meals had the same percentage of protein, the vegetable one had more fiber, which likely contributed to the feeling of fullness. Because “fullness” is a subjective measure, there is of course room for error in the study, and more research needs to be done to investigate this in depth. But it suggests that there are more benefits to vegetable proteins, and this fact will encourage more consumers to give these proteins preference in their diets. With several other factors helping to drive the vegetable protein market, new opportunities are opening for food and beverage companies. Numerous research studies are being published, sometimes with conflicting information. It is important to be able to filter these results and determine which are the most relevant, as they can reveal new ways to enter or expand within a market. Market research is a tool used to help organizations keep up to date with the newest trends and findings, and identify which measurables are worth acting on. 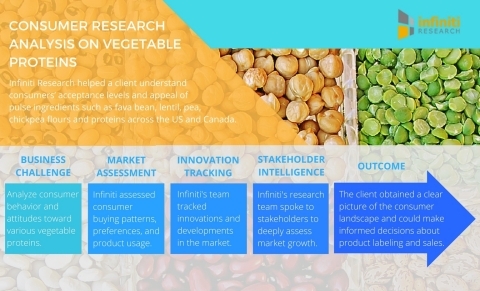 Infiniti Research analysts were recently asked to analyze the rapidly changing demand-supply shift in the vegetable protein market space, in order to gain better insights into consumer buying patterns. The client – a leading global ingredient solutions provider for the F&B, brewing, and pharmaceutical industries – approached Infiniti Research provide an understanding of consumers’ acceptance levels and appeal of pulse ingredients such as fava bean, lentil, pea, chickpea flours and proteins across the US and Canada. Infiniti Research offers expert market intelligence covering 100 countries in over 30 languages, providing actionable insights to help companies stay ahead of the curve and identify future markets before their competitors. Infiniti’s specialized research analysts have completed thousands of successful projects for Fortune 500 companies, including leading vendors in the food and beverages industry who were looking for new potential market opportunities around the world.